I recently posted my favorite strawberry smoothie which became popular at home, so yesterday I decided to make a new recipe. Because I don’t like adding sugar in my drinks, I always use banana or dates to naturally sweeten my smoothies. This recipe will become the new favorite drink this season. 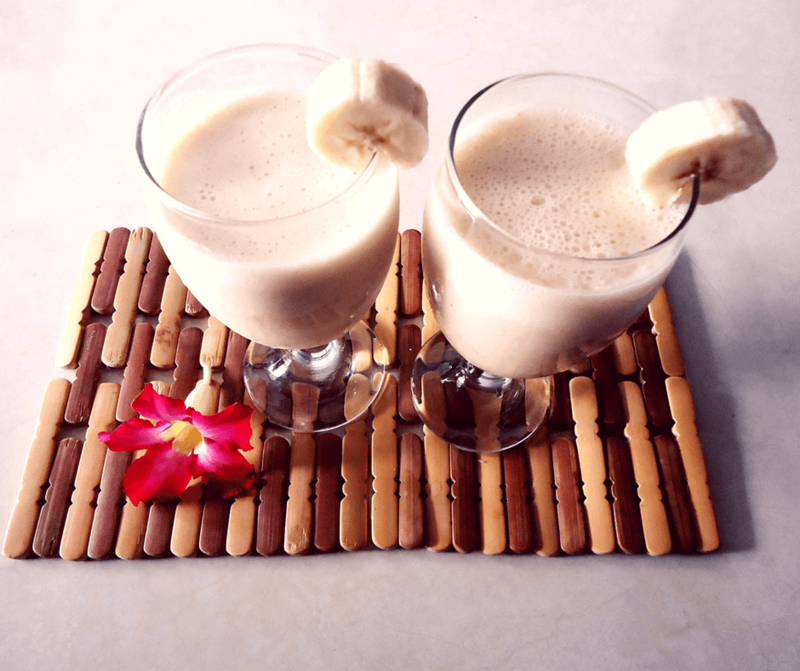 This banana and peanut butter smoothie is very easy to make and it tastes wonderful. I decided to use peanut butter because eating peanut butter helps control hunger, it is full of healthy fat and also it is high in valuable nutrition as protein potassium, fiber, Vitamin E, magnesium, and antioxidants. The first reason I use bananas is that this way I don’t have to use sugar or honey in my smoothie. Bananas are sweet enough and you can put them in every smoothie. The second reason is that banana is a potassium-rich food which is good for your heart, kidneys, and bones. Also bananas are high in fiber which improves digestion and they are high in Vitamin B6. This recipe is very simple and I always tell you to feel free and experiment adding more ingredients. I don’t add anything else in this recipe because I like it simple as it is. 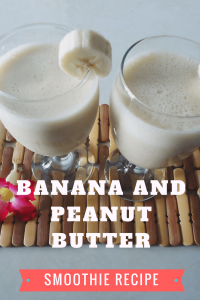 In a blender put 2 bananas with 2 tablespoons peanut butter. Now add milk. I don’t have a precise measure for adding milk because sometimes I add more and sometimes less. This depends on how thick you want your smoothie to be. With 2 bananas you will have 2 servings of smoothie or 3 smaller glasses. I love the taste of bananas and peanuts. This is so simple and easy to make and definitely, I would recommend this recipe for breakfast because it will give you so much energy. You can drink only this for breakfast and you won’t feel hunger for a long time. I hope you like this recipe. Let me know what you think. If you love smoothies, check out these grapefruit smoothie recipes. As much as it looks tasty – reading this lead me to the strawberry banana recipe instead :p!!!! I’m allergic to peanuts so looks like it worked out !! The strawberry recipe is my favorite one. I love strawberries and i am sure you would love the smoothie recipe. Love this combo! Sounds delicious as an afternoon snack. Yes, I usually make it for breakfast but snack is great too! This sounds incredible! I don’t like adding sugar to my smoothies either, so this sounds like the perfect way to drink something sweet that is still healthy. Yes Kate, this is sweet and still healthy recipe. Glad you like it. Love how simple it is to make. Yum!! I literally just finished drinking a smoothie about 20 minutes ago and definitely want to try out this one tomorrow! I love bananas! The peanut butter makes it so nice and creamy. Yes, and it gives so much energy too.